Dear Alma Mater: I Am Very Successful, So Why Haven’t You Featured Me In the Alumni Magazine? This month I received the alumni magazine and, once again, was shocked to not see my face featured as one of your notable graduates. This is nothing new. To be clear, every month since the day I graduated I have been appalled at the lack of me featured in the pages of your publication. And now I must speak out about it, or at least send you this sternly written letter in the middle of the night while I polish off this pint of ice cream. And guess what I have on all three of my desktop backgrounds? If you guessed a beautiful image of your campus, you’re wrong. It’s flowers. But I could change it if I wanted to, because A) I’m allowed to and B) I have a stock photo subscription. Don’t even worry about it. I can interview myself for your next issue because I’m always one step ahead. For example: I always use the Keurig before we run out of K cups at work. Question: What do you do on all three of your computers to be so successful? Answer: Different computer stuff than other people in my office. No overlap whatsoever. Question: What professional certifications do you have? Answer: I’m halfway to being HubSpot certified in Email Marketing. Also, one time, I added “Good Vibes” to my featured skills on LinkedIn as a joke but people keep endorsing me for it. Question: If an employer asks me if I know how to code websites just because I’m a millennial, what do I say? Answer: Yes. You say yes. And then you get a free Squarespace account and you learn how to use that ish. Question: Walk me through a typical day at work. Answer: First I drive to work. I get a reserved parking spot. Unless Dan’s in town. Then Dan gets my parking spot and I get to park like half a mile away and take a beautiful morning stroll. Then I check my email on my three computers. Most weeks, I meal prep, but last week I forgot and threw a mostly empty can of raisins in my purse. I get to eat lunch at my desk which is fun for me because I don’t like talking to people. Then, for the rest of the day I get to do all sorts of important things like answer phone calls with my very professional phone call voice, do firm-grip handshakes, and pet the office dog. Question: How do you define your success? Answer: Simple. It comes down to numbers. I have three computers and I’m on time three out of five days a week. That’s 80%. In conclusion, I am willing to forgive you for not contacting me previously to be featured in your alumni magazine. I’m happy to inform you of my own success. After all, one of my greatest strengths as a professional is being able to see my own great strengths. 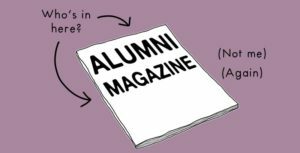 Thank you in advance for your consideration for next month’s issue of your alumni magazine. P.S. Y’all hiring? I know how to code websites.